Have you pushed the power button and nothing happens? Maybe the button has sunk underneath the top frame of the laptop. Is the problem that your button is stuck in the “on” position and won’t turn off. There can be a number of reasons why your power button has stopped working. Whatever the reason, you probably want to get it fixed quickly, but you may not know how this problem can be fixed. This article will explain how a professional can repair a broken laptop power button. If you would like this service performed on your laptop, give us a call at 1-800-919-6373 or fill out our contact form. When a laptop seems to have a faulty power button, it sometimes turns out that another component is actually causing the problem. For example, a power button may look perfectly normal except that nothing happens when it is pushed. If so, a number of problems could be preventing the laptop from booting up. This includes a faulty AC adapter, battery, DC jack, hard drive, RAM, or other components. For more information about how we troubleshoot laptops that have no power, read our page on laptop power issues. If the power button has fallen below the top frame, has stopped clicking when pushed, or in some other way is obviously broken, the fix is easy. Simply, install a brand new power button. Here is how we replace a broken power button. Before opening up the laptop, we first have to remove the AC adapter, battery, and back panel. Once the back panel is pulled away, we are usually able to see the hard drive and RAM. We unscrew the screws holding in the hard drive and remove it from the laptop. The RAM is held in by levers on either side of it. We push these down and slide out the RAM. Now it’s time to get inside the area where the power button connects to the motherboard. The first obstacle that is in the way is the “keyboard bezel.” This is a frame that is used both to protect the area above the keyboard and to make the laptop look nice. Once the keyboard bezel is removed, it reveals the screws holding the keyboard into place. When we’ve got some room between the keyboard and top frame, we are able to see the ribbon cable that connects the keyboard to the motherboard. We remove the ribbon cable by gently pulling on the connector that plugs into the motherboard. Then we lift the keyboard out of the laptop case. With the keyboard removed, we are able to clearly see the top frame of the laptop. In some models, there may be screws holding this frame in place. In others, the frame may be loose once we get to this point. We remove screws if necessary and lift up the top frame. This reveals the power switch underneath the top frame and the cable that runs from it to the motherboard. The power switch is a small circuit board that connects to the power button on the other side of the top frame. When you push down on the power button, it is actually this switch that is being pressed. This switch sends a signal through the cord to the motherboard telling it to allow electricity to flow through the circuits. After we’ve got the new power button installed, all we have to do is re-assemble the laptop and test it out. The laptop should boot right up. You don’t have to fix your laptop power button on your own. We can help. We've got the tools, patience, and know how to get your power button repair done. We have store locations in Sacramento, Yuba City, Fresno, Chico, Redding, Eugene, and Portland. If you don’t live near any of these areas, you can ship your laptop to us and we’ll fix it right away. 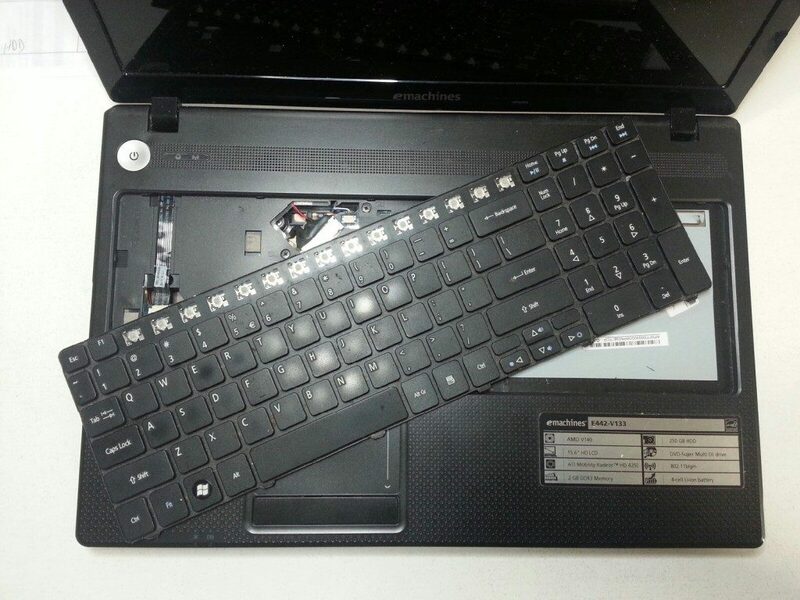 Wherever you are located in the U.S., we can fix your laptop power button problem. Call us today at 1-800-919-6373 or fill out our contact form to tell us what is going on. 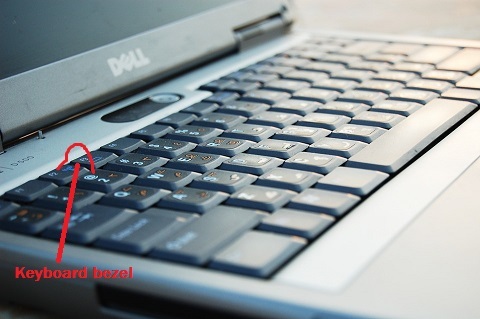 How does a laptop power button work? When you connect a battery or AC adapter to your laptop, power flows through the circuits. However, the power switch blocks the electricity from moving beyond a certain point. When you push the power button, this switch opens and allows power to move into the rest of the laptop. Kinda cool isn’t it?